In the previous article, we have learned about Time division multiplexing. In this article, we will learn about multiplexing of data based on frequency division i.e. Frequency Division Multiplexing. The frequency division multiplexing (FDM) is based on sharing the available bandwidth of a communication channel among the signals to be transmitted. Let us understand with the help of an example. A frequency division multiplexing operates in a similar way to radio broadcasting where a number of different stations will broadcast simultaneously but on different frequencies. One (People) can then “tune” their radio so that it captures the frequency or station they want. Many signals are transmitted simultaneously with each signal occupying a different frequency slot within a common bandwidth. FDM can be used with analog signals. The spectrum of FDM signal is shown in the figure below. Frequency Division Multiplexing system consists of a transmitter and a receiver. First of all, Each signal to be transmitted modulates with a different carrier frequency as shown in figure2. The modulation can be Amplitude Modulation(AM), Frequency Modulation(FM), Pulse Modulation(PM) or SSB. 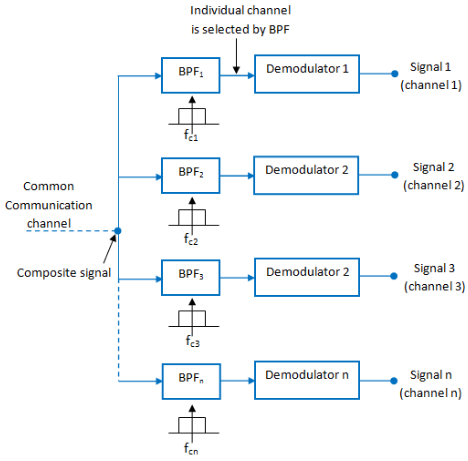 The modulated signals are then added together with a linear mixer or adder to form a composite signal (as shown in figure1) which is transmitted over a single channel. The output of the mixer is then transmitted over the single communication channel. At the receiving end, the composite signal is received using FDM receiver as shown in figure3. It is followed by different bandpass filters. Each BPF has a center frequency corresponding to one of the carriers. Each filter will pass only its channel and rejects all the other channels. After this, the signal passes through demodulator that removes the carrier signal and separates original signal. What is a Guard Band? For FDM to work properly frequency overlap must be avoided. A guard band is a narrow frequency range that separates two ranges of wider frequency. This ensures that simultaneously used communication channels do not experience interference which would result in decreased quality of both transmissions. The guard band is shown in the figure below. It is achieved with coaxial cable or fibre-optic cable. A multiplexer is used to combine many channels to maximize the use of the available bandwidth. A demultiplexer built into the television or set top box will separate the channel that the viewer wants to watch. The frequency division multiplexing does not need synchronization between its transmitter and receiver for proper operation. A large number of signals (channels) can be transmitted simultaneously. Due to slow narrow band fading only a single channel gets affected. 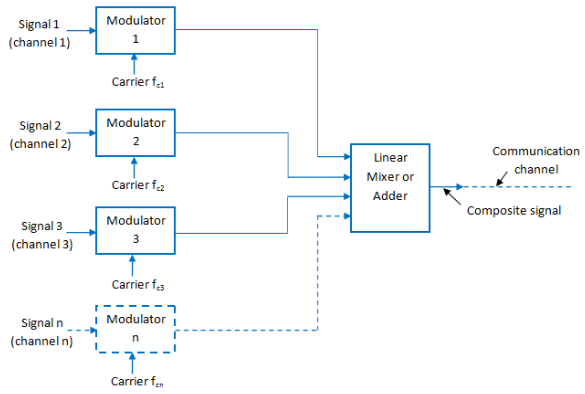 The Demodulation process of frequency division multiplexing is easy. All the frequency division multiplexing channels get affected due to wideband fading. A large number of modulators and filters are required. The communication channel must have a very large bandwidth. The frequency division multiplexing suffers from the problem of crosstalk. FDM is commonly used in TV networks. FDM is used for FM & AM radio broadcasting. First generation cellular telephone also uses FDM.